Today marks yet another big achievement for Templatelite. 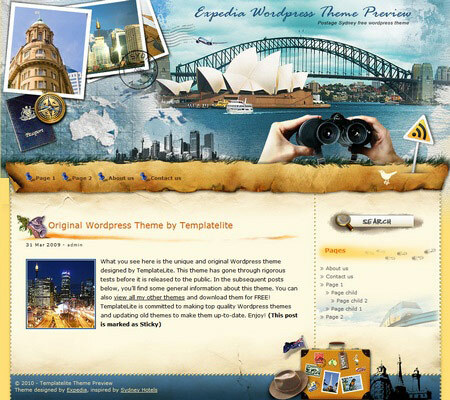 We are releasing the first theme designed exclusively for Expedia! Who is Expedia and why are we chosen? Upload your images to the “photos” folder with sizes of at least 180x200px and you’ll see the images appear in the first photo paper when the page is refreshed. More info about the feature can be found here. The Watercolor theme has a multi-level drop-down menu that is using the latest function in WP 3.0. There are two ways to create the drop-down menu. There is a featured content section below the header section. This feature is built in using the Featured Content Gallery (FCG) plugin. Please download the latest version and follow the instruction found in “Readme.txt” to do the setup. An ad widget can be found under the “Available Widgets” section. You can drag the widget to Sidebar 1. This widget allows you to add your advertisement while keeping the sidebar design. Please limit the width of your ad to 250px. 2010-09-09 v3.00 – New: Added custom header menu (works on WP 3+ onwards). One of the greatest theme that i have ever seen. Perfect theme. The best theme I’ve ever seen! Congratulations! I love a lot all these themes, here. I would be very pleased if can be made one very nice theme for beauty and cosmetic, cuz for this area is not many nice themes. Love these. Would really love one for Perth Australia. Do you plan to do one for that city as well? @Bonnie, it would be up to Expedia to decide if they want to design a theme for Perth. The next city theme is New York related. Thanks Brian. Hopefully Expedia will get around to Perth. Love these city templates and any of your others. Great qualityso appreciation sent to you for sharing. Awesome themes, I can’t believe I haven’t come across them before. I’ve already taken one of them and is going to use it on a traveling blog, and I really like the Coffe one as well. When I installed the sidney one here, I noticed that you write 2 widget spaces but I only have one widgetspace. Should I do something to get the other one, or would it be ok to create one myself in the theme? @Thomas, the other widget is meant for the 3-column theme. Since this theme is 2 columns, that additional widget is not working.